Its been a while since I have published any of the morons I come across daily while on my morning commute. From the impatiently aggressive to the downright dangerous daredevils each morning is an adventure that has me counting my blessing when I arrive safely at either end. 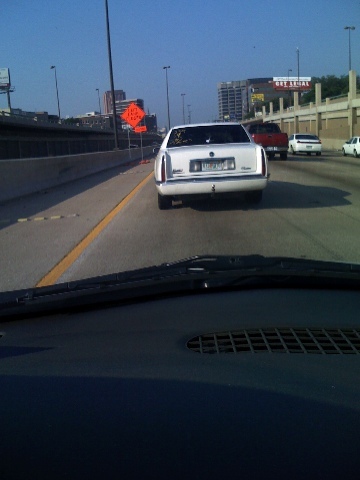 This was some looney toon whose sense of entitlement brought him to the conclusion a Cadillac rules the road and should have no trouble coming from behind me and fitting in the small gab between the red truck now ahead and my car forcing me to slam on the breaks. Narrowly avoiding being hit from the side only to have him jump back into the right lane yards ahead as the left lane was closed for construction. His final position was right behind the red truck where he started. This brain drain spent his time weaving in and out of traffic making for a dizzying time keeping up with where he would pop up next. Top that off with the lack of a helmet and this guy is just asking for trouble. And on motorcycle number two we have another mental patient with only slightly more sense than the previous in his choice of head protection. However, this only seemed to increase his own belief in his immortality as he sped around as if he was in a parking lot. I caught him in my rear view only to have him pull up next to me like some ham awaiting his picture to be taken. This guy was a real jerk bordering on using his vehicle as a weapon he forced people out of the way by being very aggressive in his driving. Obviously a new car it made me wonder how this maniac would be driving if he was in some beater or if the fact it was a new car somehow made him feel entitled to the road regardless of who else was on it. 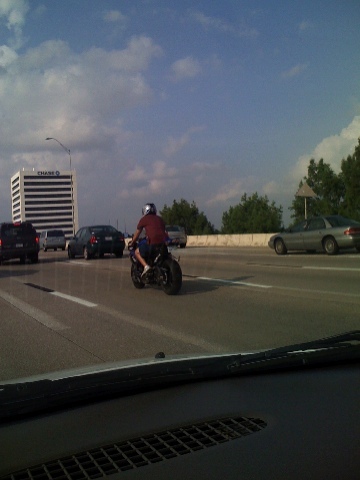 This one was a real prize managing speeds of 80mph in 30mph traffic as he wizzed around. As he flew by me I noticed it was a kid of maybe 17 driving. His parents must be proud, I hope he doesn’t end up with involuntary manslaughter charges for driving around like a moron just because he has a fast car. 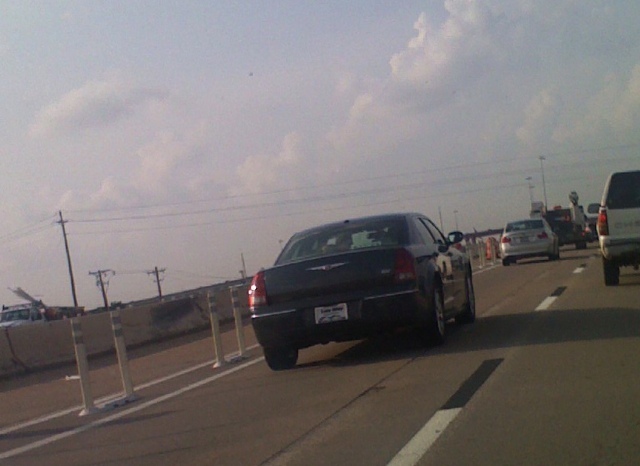 This ends my list of DFW dumb-asses who wear this badge with such pride they even show it off in their driving. Lords knows there were countless others I just wasn’t quite quick enough to get photos of or where the traffic was heavy enough I didn’t feel safe doing so. It’s crazy how many motorcycle morons there are. I’m guessing gas prices have something to do with this recent trend even though the ratio of moron motorcyclists far outweighs any other driver on the road I do find it interesting the increase in motorcyclists on the road. the one I really wish I had been able to catch was a rig driving down the road with the trailer brakes on. This made for a fantastic smoke screen behind the vehicle and glowing red wheels on the trailer. Oh well, maybe next time. Another retard on the road today. 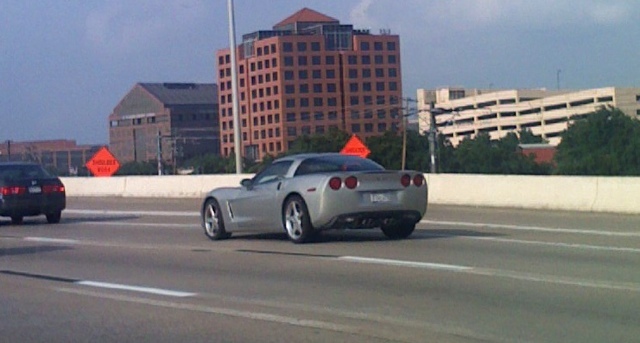 Today while making the long trek up i-35 north I was amazed to have a car pull right up next to me. Why would this be so odd? Because he was driving on the shoulder of the road!!! What makes people think this kind of behavior is ok for them but not for everyone else. 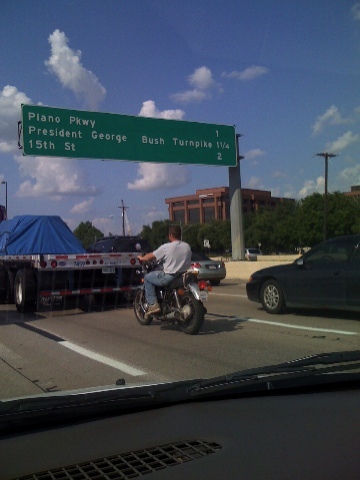 Whats the real pisser is even after his stunt, which I can only rationalize was his way of beating the traffic, I was right behind him at the exit for I-90. some people just need to have their license suspended. Like clock work this morning on the way into work I was comming onto the 121/114 merge when out of no where a gold mercedes decides he wishes to be in the far left lane. For anyone else this might have possed a bit of a problem crossing 4 lanes of traffic. Not for this woldy individual he simply cut right in front of me, a pickup truck, and finally a transport van. Once he got to the lane he wante dall was well he simply continued on his way gabbering on his cell phone as if nothing happened. I got a picture of him a bit further up the road after he moved back towards me. I will put it in here once I figure out how to download images off my cammera pone in linux. I also snapped a picture of a blue pickup truck driver who decided on I-90 to perform the same manuver to get into my lane. I was forced to hit my breaks to keep from being side swipped. After realizing what he had done he turned on his blinker in mid lane change. His head may have been up his bum but at least he wasn’t oblivious to the fact he messed up. Maybe I will invest some time in a nice merf gun to help out my fellow drivers who seem to understand the rules of the road. Check back under the general category for more info on that later! 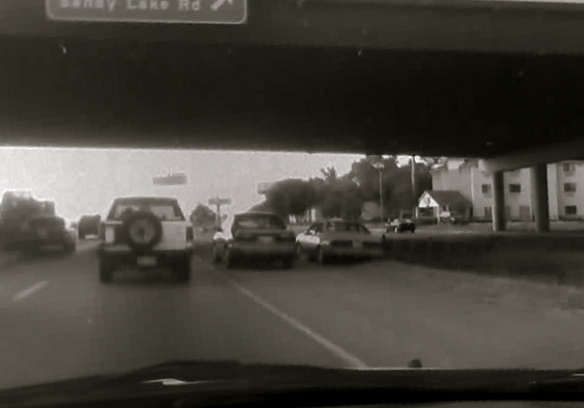 Why so many bad drivers? I remeber the first day I got my drivers license it was an experience like non-other. Driving was much better than the day it became legal for me to drink. I remember the first drive I took to my summer job on the farmers market at 4am in the morning and the daily drive home at 5pm. I never really had a problem with non-frindly drivers on the road. 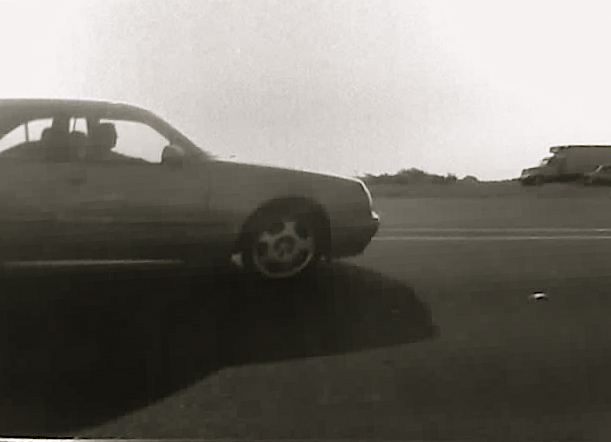 The fastlane always seemed to have people passing and the slow lane had people who didn’t want to get a ticket. Ten years later and my has the landscape changed. For the past couple of years my odd jobs have never required I leave the house before 10am. For the past 3 weeks I have been at a contract job that requires I keep normal hours from ~9am-5 or 6pm. Durring these past few weeks I have become keenly aware of how many lunatic drivers there are in the DFW area. Not a single day has gone by without viewing at the least one wreck on the side of the road. Why is this? A few observations I have made the past two days are people just don’t give a flying rats behind about anyone around them. They drive with little reguard for their own safety or the safetly of those around them. My favorite is the high price cars that simply don’t seem to come with blinkers. The drivers at these times of the day drive as if they are the most important vehicle on the road and will actually turn into your lane without so much as a signal as if to dare you to hit them. It is insane, and the worst part is the police don’t even bat an eye at this behavior which is far more dangerous and contributes to the morning conjestion than they are teenage drivers going 5-10 mph over the speed limit on the highways when they are empty. I have watched time and time again as brazen fools cut off other cars causing everyone in that lane to apply their brakes. 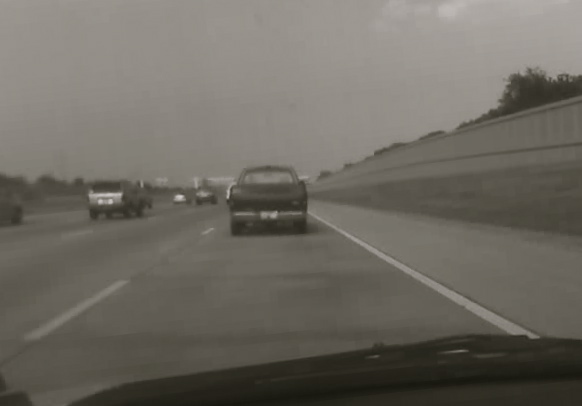 The backup caused in those lanes eventually lead to the conjestion. All so one car could get 2 car lengths ahead of the pack. The odd thing is about half the time someone else further up the line has done the same thing forcing the other driver to end up 5 car lengths behind were they started. I have decided as my little fight back against these pinheads. I will use my little camera phone to take pictures of the cars and drivers who can’t seem to show any common decency towards their fellow drivers. I know some people will think it is dangerous to take a picture and drive but it has been my experience these are the same people who lack the co-ordination to walk and talk at the same time so I’m not to worried about it. If it ends up being dangerous I will stop but I won’t stop talking about them. © 2019 Pauldy’s House of Geek. Powered by Wp. Log in.